On Long Island, 714 homeowners were making their way through the National Flood Insurance Program’s claims review process as of Oct. 23, data from the Federal Emergency Management Agency show. FEMA launched the program in 2015, after widespread accusations that private companies hired by the agency forged documents to reduce settlements. The agency contacted about 144,000 policyholders with Sandy claims, on Long Island and elsewhere, and offered to review their cases, saying homeowners could have their claims reviewed within three months by a judge or attorney acting as a neutral third party. Two years later, FEMA said that of the 19,461 requests for third-party review, 99.9 percent of homeowners have received the results, and 87 percent of cases were resolved as of Sept. 8. Of those closed cases, 84 percent received additional payments totaling more than $223 million, or about $16,000 on average, and 16 percent got no additional money. In some open cases — including about one in four on Long Island — homeowners had not provided all the necessary documents, FEMA said. FEMA officials have said the agency has improved the way it handles flood claims, creating an independent office that advocates for policyholders and a toll-free phone number for help. On Long Island, where vacant and yet-to-be-rebuilt homes still blight many coastal communities, homeowners and attorneys criticized the reviews as slow, bureaucratic and wasteful. Some homeowners said the added payments fall far short of what they have spent to rebuild. FEMA has set an Oct. 25 deadline for homeowners to complete their hearings, although Sen. Charles Schumer (D-N.Y.) said in a statement that FEMA will allow homeowners to have hearings after that date if necessary. The additional time “gives anyone with a pending claim the chance to receive their just compensation,” although “larger reforms” are needed, Schumer said. The homeowners demanded reviews because they believe FEMA underpaid them for damage caused by the Oct. 29, 2012, storm. Cathy and John Fallon’s one-bedroom home in the Village of Babylon was heavily damaged by Sandy. Cathy, 61, who helps care for a family member who is disabled, and her husband John, 73, who drives a school bus, sought estimates from three contractors to repair the 655-square-foot structure. But “it was an old beach house and they said if we try to lift this, it would just fall apart,” Cathy Fallon said. It cost almost $200,000 to rebuild, the couple said. But when they put in a claim on their $190,000 FEMA flood insurance policy — their only claim in 27 years, they said — they were paid $68,000. In addition, NY Rising, the state’s storm recovery agency, gave them about $70,000, they said. The Fallons requested more from FEMA, but the agency’s initial offer of an additional $3,277 would not have helped much, the couple said. They’re hoping for a substantial increase in the third-party review. 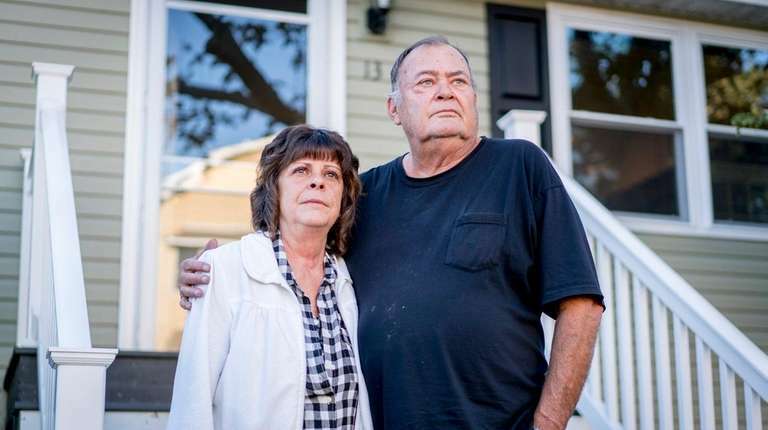 The insurance adjusters are using software programs that relied on lowball cost estimates, said John W. Houghtaling, whose Louisiana-based law firm has represented about 900 homeowners who are undergoing third-party reviews of their Sandy claims, including the Fallons. Of those, roughly 180 have open claims. “I talk with people every day who are losing their homes or going bankrupt because of this,” Houghtaling said. Some homeowners said the process did get them additional funds — even if it didn’t make up for their expenses. Beth Henry, a New York City schoolteacher, said it cost $130,000 to rebuild the Massapequa home she shares with her husband, a New York City fire marshal, and their two young daughters. Insurance originally offered $52,000, and NY Rising gave them about $30,000. After the neutral review, they received an additional $36,000 from FEMA, she said. Even the most fortunate homeowners do not get what they deserve, said August Matteis, a partner in the Washington, D.C.-based law firm of Weisbrod Matteis & Copley, which is representing about 1,200 homeowners in the third-party reviews; about 325 have open claims.